Everyone has seen a misprint in the church bulletin. 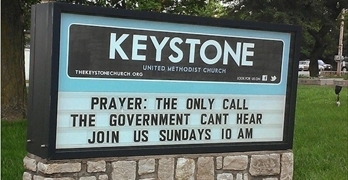 We’ve all driven down the street and passed a church sign that made us laugh. With that in mind, the following list may contain something you have seen. It might have happened in your church. Whether these are from your church bulletin, your church sign, or from a church far away they are sure to make the point that Laughter is Good for the Heart! A conflict has caused us to cancel the peacemaking meeting. Our associate pastor revealed the new pledge campaign slogan: I upped my pledge – Up yours! Our youth basketball team resumes action this coming Wednesday evening in the recreation center. Come out and watch us kill Christ the King. We have a nursery downstairs for those of you who have children and don’t know it. Choir auditions next Thursday. They need all the help they can get. This evening at 7 p.m. there will be a hymn singing in the park across the street. Bring a blanket and come prepared to sin. The Weight Watchers group meets at 7 p.m. at First Presbyterian Church. Please use large double door at the side entrance. Morning Message: Jesus Walking on the Water. Evening Message: Looking for Jesus. Ladies, don’t forget the church garage sale. A great opportunity to get rid of those things you don’t want keep around the house. Bring your husbands. We need eight new choir robes due to the addition of several new members and to the deterioration of some older ones. For “In Memory Of” donations: Place your donation in the envelope along with the deceased person you want remembered. 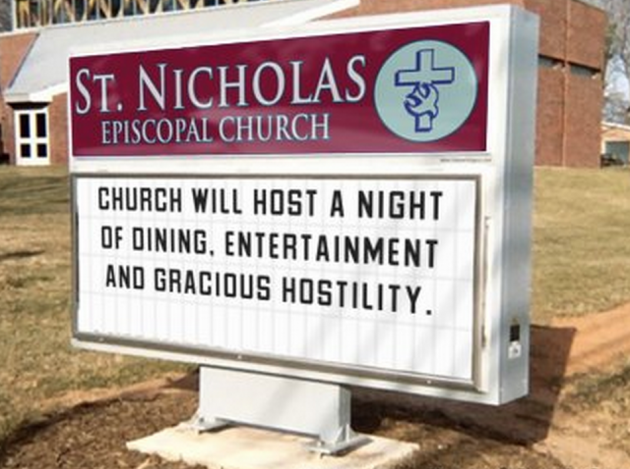 The church will host an evening of fine dining, superb entertainment and gracious hostility. Potluck supper Sunday afternoon at 5:00. Prayer and medication to follow. The ladies of the Church have cast off clothing of every kind. They can be seen in the church basement on Friday afternoon. Low Self Esteem Support Group will meet Thursday at 7 p.m. Please use the back door. The eighth-graders will be presenting Shakespeare’s Hamlet in the Fellowship Hall Friday at 7 p.m. You are invited to attend this tragedy. Every parent, pastor, and children’s Bible teacher knows to expect the unexpected when kids answer questions. You can just imagine how people responded as children gave the following “insights” on Biblical matters. 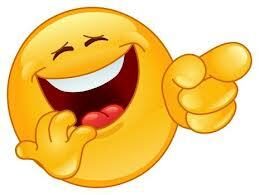 Laughter really is good for the heart and soul. And you can’t make this stuff up! Some are classic and others recent, but there’s plenty of laughter to go around. The first book of the Bible is Guinessis, in which Adam & Eve were created from an apple tree. Joan of Ark was Noah’s wife. Lot’s wife was a pillar of salt by day and a ball of fire by night. Unleavened bread is bread made without ingredients. Solomon had 300 wives and 700 porcupines. The 7th commandment is: Thou shalt not admit adultery. Joshua let the Hebrew in the battle of Geritol. David fought the Finkelsteins. They lived in Biblical times. The people who followed Jesus were called the 12 decibels. The Apostles were all married. Their wives were called Epistles. Matthew was one of the opossums. Paul preached holy acrimony, which is another name for marriage. A Godly man has only one wife. This is called monotony. If you have a “funny” to share for Laughter is Good for the Heart, see the Share Your Story tab at the top center of this website. You can submit it there, send me an email, or put it in the Comments section below! Have you gotten your tang toungled? Everyone who speaks to a group has had that slip-up. Sometimes it happens when one tries to correct something. The perceived error wasn’t nearly as funny as the correction! I’ve done that. And then there are those lines we just get wrong. No two ways about it, they are wrong, funny, and they cause lots of laughter. How many things have you seen go wrong at a wedding? You won’t believe this one! This tongue-tied parson never indicated there might be a problem. The ceremony was flawless. And believe me, there are plenty of things going on in my head during a wedding. No matter how well I know the couple, I usually write the ceremony out. It will be complete with their names written in. I have a horror of looking at the bride and saying, Do you take what’s-his-name to be your lawfully wedded husband? The families of (Bride) and (Groom) have asked me to thank you for attending the marriage of (Bride) and (Groom). (Bride) and (Groom) have also asked me to invite you to the conception in the church parlor. While all that is very good, something else about Pastor Mendez is very striking. One of our projects in Barahona this past November was the simultaneous crusade services. Those services took place on Thursday evening. We began on Monday morning asking the pastors to pray for the crusade services. We started and ended each class day with prayer. On Thursday things were a little more intense. One of the seminars I taught in Batey Los Robles on Thursday was The Discipline of Worship. My method was to let the pastors experience some of the things we had included in the study outlines. I did a brief introduction, told them I wasn’t going to cover the material in the traditional way, and then began to lead them in a time of spontaneous worship. Worship includes prayer! In our worship time we prayed about several things, including the crusade services. All that was great. When I called that ‘class session’ to an end, I asked the pastors to pray for the other two men who would preaching that night. That went well and Pastor Mendez was obviously animated by the prayer time. As far as I was concerned, our prayer time was over we needed to move on to the next session. Pastor Mendez wasn’t ready! As I was introducing the next session, Pastor Mendez interrupted me and politely informed everyone they had laid hands on the other two crusade preachers but they had not done it for me. In about three seconds I was surrounded by more than two dozen pastors. Every pastor that could reach me had a hand on me per Pastor Mendez’s instructions. Touching me or not, they were all praying, and it wasn’t quiet or passive. What was the result of our prayers? 22 people gave their lives to Christ that night. I hope this introduction will make it easy for you to pray for Pastor Mendez and all the other pastors in the Mathes Pastor Training Shcool. Pastor Fransisco has not yet graduated from the Mathes Pastor Training School. He is amiable, but serious. He is studious and always willing to be challenged. It is a delight to have him in class. In the video, he first says, Hola (Hello). He then says, God bless you. He states his name and then introduces his wife. He is pastor of a community church near Barahona, Dominican Republic. That is the model on which the school operates. It is the expectation placed on the pastors. It is also the basis for confidence in supporting the ministry of the Mathes Pastor Training School. So far, the growth results in the churches led by these pastors (like Pastor Fransisco) is more than exemplary. But is that something we ought to see as unusual? What is being accomplished in their ministries is unusual by most standards. But if it’s examined through Biblical expectations, it might be under par. Didn’t the Lord tell us reach the world? To do that, the minimum growth rate in our churches would have to match the birth rate? Think about it. And the truth is, if we were suddenly super-effective starting tomorrow, we would start out behind! Maybe the work being done in out-of-the-way places by men like Pastor Fransisco ought to studied by others. At the very least, we can be thankful for men like Pastor Fransisco and all the other pastors who are doing such a great job. And we can pray for them as they continue. Want to lay up for yourself treasures in heaven? CLICK HERE to help fund this ministry and the 2015 church planting effort in the DR.
One section of the Mathes Pastor Training School in Barahona meets in Batey Los Robles. Our host pastor is Pastor Ramon. He is a good friend and a devoted follower of Christ. Everything I know about Pastor Ramon is made better by knowing his family. His son and daughter are often present for class. Both are delightful, sharp young people. The son is a little more introverted than his sister. Well, that’s an understatement. She’s definitely the extrovert. She can particiapte in class with great questions and great answers. Pastor Ramon is building the next generation as well as equipping an effective church. Different cultures place different expectations on pastors. Some of them are not necessarily Biblical, but they are expectations. One of those for Pastor Ramon is dressing to preach. Guess that one is not limited to a single culture! His economic situation didn’t really allow him to meet that expectation. What happened? One the pastors that helped us teach in 2013 arrannged to send Pastor Ramon a suit. (CLICK HERE to see a previous post about a handsome pastor) And that was not the only time. As we meet more and more dedicated, Godly servants of Christ we discover new opportunities for ministry. Before you have a Spring garage sale, send us a note. You never know what’s hiding in your closet or garage that might meet a need for a pastor and his family.And even if you don’t have material things to meet a need, your prayers are needed for Pastor Ramon and others as we engage in planting new churches in 2015! The English version comes across as Pastor Edward. He was part of the first seminar offered. He was also a member of the first graduating class this past March. This post is on the blog page as reminder of the Meet the Pastors series (published under the Stories tab). Pastor Edward does a great job in his ministry. When he arrives for class, he usually has two other pastors on his scooter. He has a heart for ministry as well as his fellow ministers. Space won’t allow me to tell the story, but Pastor Edward is a great example of faith. It took quite a few discussions for these pastors to understand the Biblical idea of restoration. Their culture and tradition takes the position: one strike and you’re out! The Church has long been known as the only army that shoots its wounded. Part of our work with these pastors was to help them overcome rigid legalism and embrace the Biblical concept of grace. One particular session will always remain in my memory. 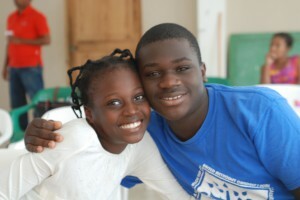 We had spent a great deal of time that particular week stretching their understanding of grace. Honestly, our faculty was a little frustrated. In our evening evaluation session (back at the Mission House) we came up with a strategy to address the subject in the next day’s lessons. It was a little unusual, but we prayed about it and sensed it was the right thing to do. Our morning sessions went well the next day (a Wednesday). On Thursday, Pastor Edward was noticeably excited as we began class. He wanted to share something. I let him do it. He had used our lesson material from Wednesday morning as his Wednesday evening message at his church. We had challenged the pastors to act Biblically. In response, he challenged his congregation to act Biblically. There was a problem in the congregation and community. The pastor and the church confronted it. What was the result? There is a predicable progression at work. 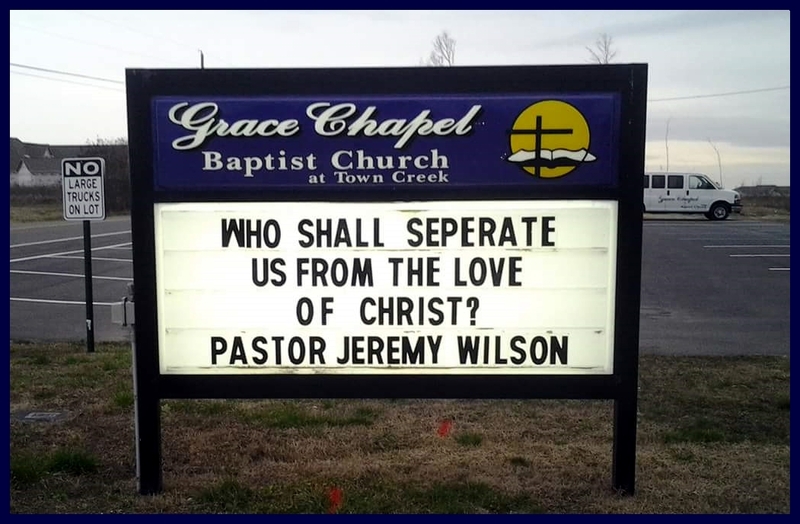 This pastor decided to act in faith. He expected others to act in faith. Their collective acts of faith resulted in a long-standing problem being resolved before everyone went to bed on Wednesday evening. I can’t wait to see what will happen when a man like this acts in faith to plant a new church! Will you pray for Pastor Edward? We need your help! Our 2015 ministry people and projects will need funding. That will include engaging men like Pastor Edward in planting new churches. Pastor Pedro V. leads a church in Batey Santana. He graduated from the Mathes Pastor Training School this past March. He is continuing his studies. Anyone would notice the quiet nature of Pastor Pedro V. He is always cordial with a pleasant smile. 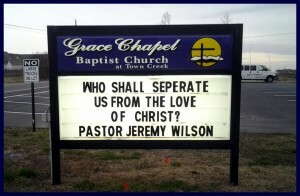 That might lead you to think he lacks a certain passion for ministry. That would be incorrect. 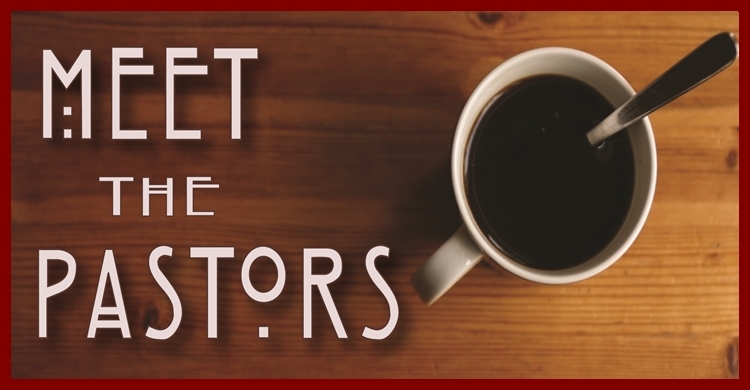 The evangelism results in the church he leads point to a dedicated pastor. And that is what these pastors have in common; a deep dedication to know and serve the Lord. They are also dedicated to serving and reaching others with the good news of the Gospel. I trust you will pray for Pastor Pedro V. as well as our other Pastor Pedro. What God is doing among these pastors is truly awesome. I am grateful to get to be part of it. I am also glad to be able to give you that same opportunity! 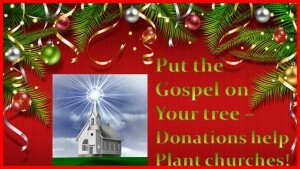 Engage with us by praying and if possible, make a donation to help equip this ministry going into 2015. Training the pastors is bearing fruit. Planting churches will cause that to increase!